Beijing used to call the Dalai Lama 'a wolf in monk's garb', now they say that he brings 'bad luck' to the people who meet him. They cite the examples of the Jetsun Dampa (or Tampa for the Chinese) of Mongolia who in 1991, was recognized by the Tibetan leader as the head of the Buddhist Church in Mongolia and lives in Dharamsala. Then Vaclav Havel, the former President of the Czech Republic who has had encounters with the Dalai Lama for the past 30 years and also Dorjee Khandu, the late Chief Minister of Arunachal Pradesh who died in a chopper crash in April 2011. This is a laughable accusation, though it showsthat the Chinese leadership is quite desperate. It perhaps explains why they are so afraid to meet him, will they die soon after? More seriously, it is a tragedy that Beijing is unable to grasp that the Dalai Lama is their best bet to solve the Tibetan issue. He is the most moderate leader and he commands respect from the Tibetan 'masses' whether in Tibet or in exile. One of the greatest shock for the Communist leadership was when, during the Kalachakra held at Amravati in Andhra Pradesh 2006, they realized that the words of the Dalai Lama were obeyed as orders inside Tibet. During his teachings on Nagarjuna, the Tibetan leader sent a strong message to Tibetans from Tibet about the importance of preserving Tibet's wildlife heritage. He said that he had heard and seen pictures of Tibetans wearing elaborate costumes adorned with banned animal furs and skins. After he had condemned the use of endangered animals' skin, thousands of Tibetans burnt their fancy dresses or headgear in Tibet. The Chinese suddenly realized the power that the Dalai Lama still has on the Tibetan populations despite 60 years of propaganda. Their answer was to demonize him further. If the leadership in Beijing was intelligent, they would use the Dalai Lama's power on the Tibetan people to sort peacefully the problem of Tibet. But they are probably too scared to meet him. On the day when a boy named Lhamo Toinzhub was recognized as the 14th Dalai Lama, Tibetan Buddhist Guardian Neqoin foretold that he signaled a "bane", who would bring ill luck. In recent years, there has been widely spread that the boy has a "spell", and anyone getting close to him will be doomed. What's more, a series of events have proved that the spell has worked. People who have met with the 14th Dalai Lama during the last two years have all got misfortunes. They either fell seriously ill, or went to jail, or even died from a violent death. According to a report from Mongolia on Dec. 22, 2011, its so-called "religious leader","the 9th Jetsun Tampa", who was brought up by the 14th Dalai Lama, suddenly suffered from cerebral hemorrhage and lost consciousness. This happened not long before "the 9th Jetsun Tampa" had a close talk with the 14th Dalai Lama on Nov. 2, 2011. It was a pity that all the Mongolian Jetsun Tampas had short lives among them, and "the 3rd Jetsun Tampa" had the shortest life, who died of some unknown illness at the age of sixteen. "The 9th Jetsun Tampa" was the only one, who had a comparatively longer life, but "the child of fortune" was suddenly dying after meeting with the Dalai Lama. Could this only be a coincidence? On Dec.10, 2011, former president Vaclav of the Czech Republic met with the Dalai Lama. The two had a "pleasant meeting" as the president described. Unluckily, just 10 days after the meeting, Vaclav died. On the same day three years back, former president Lech Kaczynski of Poland met with the 14th Dalai Lama in Warsaw and congratulated him on his title of "honorary citizenship" of Wratislavia City of Poland. While they were feeling complacent for their action, the plane of the former Polish president and his wife crashed in western Russia on April 10, 2010, killing all the 97 crew members on board. On that day, the Dalai Lama expressed brazenly his sorrow over the death of the president and his admiration for the late president's "dedication". I bet the Dalai Lama must feel too embarrassed to visit Poland again. Likewise, another friend of the Dalai Lama also died from a plane crash. Arunachal Pradesh (in China's southern Tibet) Chief Minister Dorjee Khandu met with the Dalai Lama warmly in November, 2009 when the Dalai Lama dubbed himself the "son of India". It was so unexpected that just a year and a half later, Dorjee Khandu died. The helicopter he took disappeared in the jungle on its way to India's Itanagar from Tawang on May 5, 2011.
aybe we could find such a rule. In the recent years, so many countries have rejected the Dalai Lama's visits. Some leaders who are afraid of mishaps avoided meeting him even if he arrived in their countries. So even an official of the "Tibetan government-in-exile" had to admit that the host country or organization will bear a big pressure to meet with the Dalai Lama himself than the "Tibetan government-in-exile". And the most unlucky person must be Chen Shui-bian, former leader of China's Taiwan. Since 1997, the 14th Dalai Lama has visited Taiwan for three times. But all his visits had brought misfortune to Chen and his family. Some were hit in a serious car accident, some was shot, or even Chen himself went to jail! 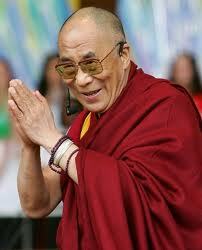 The Lama himself didn't show any of his sympathy, but hailed Chen's imprisonment. The Dalai Lama has not only brought ill fortune to his friends, but also his own family. It is said that his father died not longer after he went to Tibet from Qinghai. On Feb.14, 2011, the Dalai Lama's nephew Jigme Norbu suddenly died from a car accident in the United States, a year after he showed his hope that his oldest nephew would make some contributions to his family during his visit to the US. The Dalai Lama always claims that he can bring great fortune to people who symphonize or support him. In fact, all those most in favor of him have suffered from misfortunes one after another. In spite of these, he launched another "Great Prayer Festival" in the last few days. God knows how many lives will he claim again in this world. It seems that it is not a fairy tale that whoever gets close to the 14th Dalai will be hexed, but it is an ongoing cast spell! I will accept that "bad luck", I know the Chinese officials lie and once someone lies to me I can never believe them..